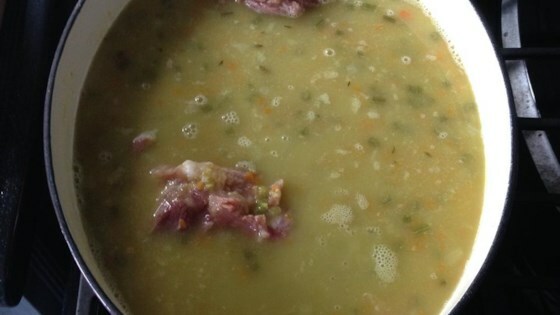 "Split pea soup is a great way to use a leftover Christmas ham bone!" Melt butter and oil in a Dutch oven over medium-low heat. Add celery, onion, carrot, and salt. Cook and stir until tender, about 5 minutes. Stir in peas and garlic. Nestle ham bone into the pot; add stock and diced ham. Fill pot with water to about 1 1/2 inches from the top. Mix and bring soup to a boil. Reduce heat to low and cover. Simmer, scraping the bottom of the pot and stirring every 30 minutes, until peas are mostly disintegrated, about 2 1/2 hours. Turn ham bone and skim surface for fat once every hour. Take bone out, remove any meat, and return meat to the pot. Season with salt and pepper. I added 7 cups of liquid ( more water than broth). The ham that is on the ham bone was enough ham for the soup. So easy and delicious! Made it as written. It was phenomenal. Absolutely, would I attempt it again! I even whipped in a block of cream cheese! My husband and I loved it. I did add 2 bay leaves. Will definitely make it again!